On Saturday, April 28, he U.S. Drug Enforcement Administration’s National Drug Take-Back Initiative collected more than 276 tons of medications. 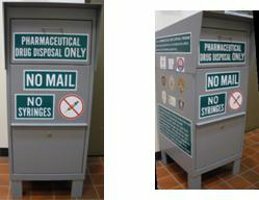 While such periodic collections address the dangers of discarded medications, our unwanted, old, and expired prescriptions and over-the-counter drugs continue to be an ongoing, everyday problem. If the drugs are in your home, they pose a hazard to children and pets. If you flush them, they contaminate the local water supply and give your neighbors unsuspected doses of narcotics, hormones, antibiotics, and steroids. If you toss them into the trash, they may end up in the hands of scavengers who will resell them. If they make it to the landfill, they become toxic waste that contaminates groundwater. 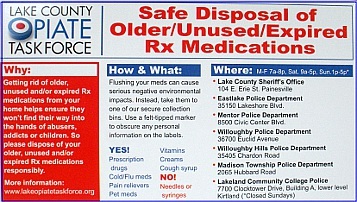 Now, however, rather than waiting for the next National Take-Back Day, local residents have a much better option: they can take their unwanted, unusable drugs to one of the seven Lake County Opiate Task Force drug disposal drop-off bins. Monday through Friday, 7:00 a.m.–8:00 p.m. Needles and syringes are not accepted. Leave the medicines in their original package or container, and be sure to black out all personal information on prescription labels before discarding the containers. The Task Force is also distributing refrigerator magnets that contain this information. The magnets are available without charge at local pharmacies and social service agencies and will be distributed at community events. The Lake County Narcotics Agency will destroy the collected drugs.